On the outskirts of Fizzytopolis proper -- past the well-manicured suburbs -- in the rolling hills dotted with farmlands and undeveloped property sits a small ranch. This is the Hatchery; a place which specializes in helping trainers and their Pokémon usher in the next generation. Seated on four acres of pristinely maintained land, the Hatchery is a paradise overflowing with groves of fruiting trees, bodies of water, and plenty of private nooks and crannies to help facilitate... delicate discussion. 1. If you have obtained an egg, post here with the link to where you received it so we know what its requirements and limitations are. 2. Your egg will hatch in the amount of time as has been set by your updater. If none have been given your egg will hatch in one week’s time upon posting in this thread. 1. A trainer may only breed any combination of their Pokémon four times within one calendar year. 2. A single Pokémon may only breed twice within one calendar year. 3. Both Pokémon being bred must be a minimum of Lv. 20. 4. Both Pokémon must be within the same egg group. 5. One trainer may drop off two Pokémon, or two trainers may make arrangements to drop off one Pokémon each. In the case of the latter, only the trainer who picks up the hatchling will use up one of their four breeding allowances for the year, though allowances are still used up for both Pokémon. 6. It will take one week for the parent Pokémon to breed, and one week for the egg to hatch. The following species require a parent to be holding a specific held item. ★ Wynaut: Wobbuffet holding Lax Incense. ★ Azurill: Marill/Azumarill holding Sea Incense. ★ Budew: Roselia/Roserade holding Rose Incense. ★ Chingling: Chimecho holding Pure Incense. ★ Bonsly: Sudowoodo holding Rock Incense. ★ Mime Jr.: Mr. Mime holding Odd Incense. ★ Happiny: Chansey/Blissey holding Luck Incense. ★ Munchlax: Snorlax holding Full Incense. ★ Mantyke: Mantine holding Wave Incense. The following breeding combinations (including evolved forms) have a 50/50 chance of producing offspring of either parent species. This only applies when the corresponding lineages are bred together. ★ If both parents are shiny, odds that the offspring will be shiny are 50%. ★ If one parent is shiny, odds that the offspring will be shiny are 25%. ★ If neither parent is shiny, odds that the offspring will be shiny are standard. As you step into the Hatchery, a young woman in a ruffled pastel dress is slightly startled by your presence. Throwing a hand over her mouth, she exclaims "Oh my goodness, I didn't hear you come in! Hello there!" She offers you a curtsy and a bashful smile. "Welcome to the Hatchery! Everyone usually calls me Miss Lulu. You must be here because you're hoping to get a little baby Pokémon of your own, right? Well, don't you worry, you'll be in good hands here. Our incubation systems are the very best! And we promise that there will always be a caring staff member on hand to welcome your new team member to the world." For your peace of mind, Miss Lulu takes you for a brief tour of the facilities. The Incubation Room is painted in soft, soothing colours and features a couple of plush chairs, each draped with hand-knitted blankets. There are shelves packed with books on Pokémon care, their spines creased from use. There's even a slightly worn rocking chair in one corner. When Miss Lulu hatches an Egg for you, your new Pokémon may display some unique behavioural traits! Of course, we change as we mature, and Pokémon are no different. If you don't feel like the personality shown by your new hatchling is what you were hoping for, then you're welcome to forget about it entirely. However, for trainers who don't have a particular vision for their newly hatched Pokémon, maybe these early behaviours will indicate what sort of personality they'll go on to develop. Ultimately, it's all up to how you raise them! On the far end of the Hatchery, a man runs about in pastel scrubs. While his movements and baggy eyes may suggest irritation, though, a wide smile decorates his face as he takes pictures of baby Pokemon and makes notes next to the polaroids that print out as he tapes them to his notebook. The man turns to you, still scribbling notes, to address your presence, "Oh! Hello, hello! Are you here to pick up or er... drop off?" Flipping through his notes only to realize his mistake, he extends a hand, "Sorry, sorry. I'm Doctor Grossman, and I run the nursery you see here. Feel free to drop off any Pokémon with me that wish to have little ones of their own, though due to limited staff and looking out for the well being of the parents we do have some limitations on frequency," the Doctor proceeds to hand out a small pamphlet full of rules as he explains, "after drop off, we'll keep the parents for a week to... make sure everything goes well. After that point it will take another week to care for their egg in our specialized incubators. After that, though, we more than encourage you to join us in welcoming your new team member into the world." While Pokemon brought into the world by Doctor Grossman and his staff may initially display behavioural traits similar to their parents, Pokémon are perfectly able to change as they grow. Any personalities displayed by your new team members may be temporary and can be ignored, though you are free to nurture them with these traits in mind so that they grow into them. In the end, everything comes down to how you raise this new member of your team. No eggs incubating at this time. Last edited by Marion Ette; 12-03-2018 at 08:16 PM. Sandaa and Patches (1/4): Male Blastoise Raphael (1/2) and Female Seel Aika (1/2), Old Spice Incense. Hatched a male Squirtle on Monday, 15th of January. Ex-Admiral Insane and Maskerade (1/4): Male Absol Doom (1/2) and Female Seviper Vega (1/2), Old Spice Incense. Hatched a female Absol on Monday, 15th of January. Meetan and Sandaa (1/4): Male Amaura Theo (1/2) and Female Ampharos Amph (1/2), Old Spice Incense. Hatched a male Amaura on Monday, 15th of January. TheKnightsFury and biggggg5 (1/4): Male Chespin Ajax (1/2) and Female Swinub Elsa (1/2), Old Spice Incense. Hatched a male Chespin on Tuesday, 16th of January. Ex-Admiral Insane (1/4) and Gemini Spark: Male Garchomp Hai (1/2) and Female Lapras (1/2). Hatched a shiny female Lapras on Wednesday, 17th of January. Naruxami (1/4): Male Incineroar Morgana (1/2) and Female Leafeon Vinny (1/2), Old Spice Incense. Hatched a female Litten on Tuesday, 23rd of January. 134 (1/4): Male Tranquill Ho'opunipuni (1/2) and Shiny Female Dartrix Uhane (1/2). Hatched a male Rowlet on Tuesday, 23rd of January. Naruxami (2/4): Male Incineroar Morgana (2/2) and Female Leafeon Vinny (2/2). Hatched a female Eevee on Tuesday, 30th of January. Sneaze and 134 (2/4): Male Raichu Kevin (1/2) and Female Houndoom Pouli (1/2), Old Spice Incense. Hatched a male Pichu on Saturday, 3rd of February. EpicSquirtle (1/4) and Maskerade: Male Tauros Vernon (1/2) and Female Absol Helel (1/2). Hatched a female Absol on Tuesday, 13th of February. Gemini Spark (1/4): Male Zangoose Rengar (1/2) and Female Blaziken Vi (1/2). Hatched a male Torchic on Saturday, 17th of February. Meetan and TheKnightsFury (1/4): Male Amaura Theo (2/2) and Female Axew (1/2). Hatched a male Amaura on Monday, 19th of February. Missingno. Master (1/4): Male Dusknoir Peeves (1/2) and Female Dusknoir Liliana (1/2). Hatched a male Duskull on Tuesday, 20th of February. 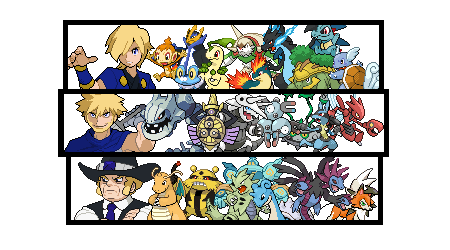 Sandaa (2/4) and Ex-Admiral Insane: Male Golduck Kratos (1/2) and Female Wailord Pearl (1/2). Hatched a female Wailmer on Sunday, 25th of February. Sandaa and Ex-Admiral Insane (2/4): Male Pupitar Tyrant (1/2) and Female Haxorus Sar (1/2), Old Spice Incense. Hatched a female Larvitar on Sunday, 25th of February. Maskerade and Schala (1/4): Male Totodile Ryuga (1/2) and Female Spheal Amphitrite (1/2), Old Spice Incense. Hatched a Male Totodile on Wednesday, 28th of February. TheKnightsFury and Maskerade (2/4): Male Nidoking (1/2) and Female Absol Helel (2/2), Old Spice Incense. Hatched a male Nidoran on Thursday, 8th of March. EpicSquirtle and TheKnightsFury (2/4): Male Electivere Crix (1/2) and Female Mienfoo (1/2), Old Spice Incense. Hatched a male Elekid on Monday, 19th of March. Sandaa and Naruxami (3/4): Male Ivysaur Venu (1/2) and Female Lapras Cordelia (1/2), Old Spice Incense. Hatched a male Bulbasaur on Tuesday, 20th of March. Meetan and 134 (3/4): Male Torchic Blaze (1/2) and Female Houndoom Pouli (2/2), Old Spice Incense. Hatched a male Torchic on Sunday, 29th of April. Maskerade (3/4) and Sandaa: Male shiny Zweilous Zyll (1/2) and Female Charizard Ramoth (1/2), Old Spice Incense. Hatched a shiny female Deino on Sunday, 29th of April. TheKnightsFury and Naruxami (4/4): Male Chespin (2/2) and Female Nidorina Jean (1/2), Old Spice Incense. Hatched a male Chespin on Sunday, 29th of April. Maskerade (4/4) and Gemini Spark: Male Charizard Volg (1/2) and Female Grovyle Nissa (1/2). Hatched a female Treecko on Monday, 14th of May. Meetan (1/4): Male Honedge Hermes (1/2) and Female Geodude Gracie (1/2), Old Spice Incense. Hatched a male Honedge on Friday, 1st of June. OkikuMew and Gemini Spark (2/4): Male Tyrunt Boxcars (1/2) and Female Dratini Sorano (1/2), Old Spice Incense. Hatched a female Tyrunt on Friday, 1st of June. 134 (4/4): Male Alolan Raichu Wilikoi (1/2) and Female Delibird Ha’awi (1/2), Old Spice Incense. Hatched a female Pichu on Saturday, 2nd of June. OkikuMew (1/4) and Gemini Spark: Male Tyrunt Boxcars (2/2) and Female Dratini Sorano (2/2). Hatched a male Dratini on Wednesday, 6th of June. TheKnightsFury (3/4) and Sandaa: Male shiny Charizard Balerion (1/2) and Female Dragonite Brynhildr (1/2). Hatched a Male Dratini on Monday, 18th of June. Sandaa (3/4) and Maskerade: Female Ampharos (2/2) and Male Lucario (1/2), Old Spice Incense. Hatched a Male Riolu on Tuesday, 26th of June. King Ghidorah (1/4) and TheKnightsFury: Male Honedge (1/2) and Female Onix (1/2). Hatched a Male Onix on Friday, 3rd of August. Sandaa (4/4): Starmie (1/2) and Ditto (1/2). Hatched a Male Corsola on Thursday, 27th of September. King Ghidorah (2/4) and OkikuMew: Male Kingler (1/2) and Female Corsola (1/2). Hatched a Staryu on Thursday, 27th of September. Last edited by Maskerade; 02-28-2019 at 06:06 AM. The doors to the Hatchery's private rooms slide open, and out comes Junior Assistant Dr. Newman. His jovial expression attempts to conceal the intense nervousness that comes with his first official hatching; after all, not only is the light-blonde-haired youngster quite socially inept, he knows he is still under evaluation by Dr. Grossman, and that he is still far from a replacement of the great Professor. At best, he is a resident - a very green, but very eager resident. "Hello Trainers... hum, Jayson and Gary. Wait... Gary? As in Elite Three Gary? Oh god..."
Palms sweaty, knees weak, arms heavy from the weight of the egg pod, he places the large glass container on the counter, praying to Arceus he doesn't drop it in front of Fizzytopia's overlord. Then, he hands Jayson and Gary their PokéBalls containing Balerion and Brynhildr respectively. Finally, he bows and takes three steps back, allowing the parents to witness the miracle of birth with some manner of privacy. Congratulations! You've hatched a Lv 1 Male Dratini! Last edited by Maskerade; 11-07-2018 at 08:50 AM. Picking up my little dragon, naming him Ryujin, declaring his ability to be Marvel Scale and putting him in my last Luxury Ball. I'm here to chew gum and hatch eggs... and I'm all out of gum. Sandaa (3/4) and Maskerade: Female Ampharos (2/2) and Male Lucario w/ Old Spice Incense. Hatchling due Tuesday, 26th of June. Hatching this little one, please! "O-oh. Pokemon Master Gary! Nice to see you again," he stammered, adjusting his glasses nervously. "T-this one will be for you, r-right? Great, great, splendid." And then, he saw him. The legendary Professor Pine from Heiml, expert in Bonds, standing right next to Elite Three Gary! "OH! Oh my, I... you are... oh dear, you are. I'm a big fan of yours Professor, and I would love to..." suddenly, he remembered he had a job to do, and that Dr Grossman was no doubt taking notes of his embarrassing descent into fanboyism right in front of customers. "I-I mean, later. This moment is yours, after all." Congratulations! You've hatched a Lv 1 Male Riolu! Last edited by Maskerade; 06-26-2018 at 07:38 AM. Picking up my precious little lv.1 male Riolu, thanks! Placing him into this Luxury Ball. Dropping of this enigma egg from bimonthly staff rewards to be incubated. Thanks! Dropping off this Enigma Egg for incubation. Thanks! In state-of-the-art hatching modules, the eggs under the care of Miss Lulu live in perfectly temperature-controlled environs for as long as they need to incubate (which, mysteriously, always seems to be exactly one week - researchers to this day are still baffled by this phenomenon) and grow into fully-formed baby Pokemon. Not a single gust of wind or drop of rain, not a single deviance in temperature or humidity... the perfect little encased world for these perfect little ovoids. The world outside, however, is something of a rude awakening. Before the two little babies can open their eyes, their ears are blasted with the sound of whirring air - fans, operating on full blast - which do little to mitigate the oppressive heat and stifling humidity of midday July. Miss Lulu, desperately fanning herself with an old magazine, immediately turns her makeshift fan to the babies in an attempt to cool them off. One of the babies, a white, seal-like Pokemon, discovers right away that he is capable of a little trick - a delicate spray of water over himself, and he is feeling nice and cool. He splashes Miss Lulu's face with another spray, and she giggles, looking appreciative despite the unexpected soak. The other baby, despite her tree-like appearance, is far less than enthused at the attempt to cool her off. Storming off in indignation at being attacked without provocation, Miss Lulu does her best to turn the stubborn baby around and explain, very gently, that the act was an attempt to help. Already, however, the water type in question has become listless from the heat, and has curled up into slumber. The pseudo-tree immediately begins crying - it was hard for even Miss Lulu to tell whether she was doing it to draw fluids out of her body, or show her emotional state... perhaps both. With all the moisture in the air, the baby would probably be crying awhile... while the cold-weather loving seal seemed to be getting more and more uncomfortable in his attempts to sleep off the heat. Miss Lulu frowns. Hopefully these two would be adopted by trainers who liked to travel, because neither of these little ones seemed at all suited to the humid environment outside. An idle thought passes through her mind of escaping the hatchery with the babies to go on a trip to the beach... If only. OkikuMew has hatched a Lv1 Female Bonsly with EM Headbutt. Naru has hatched a Lv1 Male Seel. Last edited by Marion Ette; 07-04-2018 at 10:20 PM. Isaac hated wearing shorts, especially with his hairy legs on display for everyone to see. It wasn't that he didn't know how to shave, he just hated putting the effort into shaving when he knew that the hair would just grow back in a week or two. 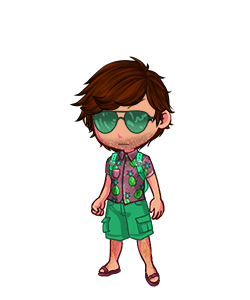 He sighed irritably, he probably could've packed something a little less stupid to wear in Fizzytopia as well --- this disgusting pineapple shirt made him look like an awful tourist. At least he had some cool sunglasses to keep the sun out of his eyes. Vinny had picked them out at a convenience store the two had stopped at to buy cigarettes, and although he usually wasn't a glasses guy, he had to admit the Leafeon had good taste. Speaking of the Leafeon, the weather seemed to energize her. She bounced around happily, letting the sun's rays hit her leafy ears with small happy twitches. He supposed it was a plant thing, but he certianly felt like he was going to wither away any second now. He yanked the collar of his shirt, huffing out a loud breath. "Can we go back to Unova yet? It's not as hot there." He asked, causing Vinny to roll her eyes. She liked their new home, and she refused to go back to that awful industrial region in her new form. The pollution would turn her leaves rotten, and she wasn't exactly one to be looking gross with that strapping new male on their team. As she stared off dreamily, Isaac sighed. Where did her mind keep wandering off to? She had been like this since he found Kyp... and he was getting mighty suspicious that the Leafeon might be developing a small crush on the Electrike. "Oh thank god," Isaac breathed out, causing Vinny's ears to perk up. "We're here." He swung the door to the hatchery open, feeling the cooling sensation from the mediated environment almost instantly. He sighed in relief, it was way too hot a day to welcome his new egg into the world. Fanning himself with his hand, he approached the counter --- looking at the adorably dressed Miss Lulu. She looked wet, exhausted, and very hot. Isaac smiled politely, taking off his sunglasses. "I'm here to pick up my baby," He chuckled to himself, examining Lulu's wet hair, "I hope my baby wasn't the one to do that." Lulu brushed it off, a smile on her face and a skip in her step. He supposed with the heat outside, it probably felt quite refreshing to be sprayed with water. As he walked to the back room with her, he noticed the adorable little Seel that was groaning in the heat, as well as the cute tiny tree would was crying out. He gave a pitied smile, he couldn't imagine it being very fun to be brought into the world in this kind of weather --- hell, his birthday was soon and he'd probably be crying the same way. Miss Lulu gestured towards the Seel with a smile on her face and Isaac's eyes sparkled, what a cutie! He approached and examined the Seel with curious intent, making note of the fact it was a male and that he should probably get it somewhere a little cooler. "Hey little guy! I'm Isaac, I'm going to be your new master... i-if that's alright with you of course!" He smiled, causing the Seel to clap happily. "I have some friends at home that would love to meet you! I'm sure you'll all get along!" He thought instantly of Cleo and Ophelia, his Kingdra and Lapras. They would surely love to have another water Pokemon drifting around. With a happy nod from the Seel, he pulled out one of the Great Balls that was rolling around inside his backpack and smiled happily at Miss Lulu. "Thanks Miss Lulu! I'll take great care of the little guy!" He put back on his sunglasses and got ready to face the heat once again. I'll put her in one of my many yet ordinary Pokéballs to keep her cool until she finds a good trainer and home for her. Thank you! Had it been a week? More? Kawaii wasn't sure. She was still new to the whole hatchery place. She tugged on her bag nervously as she walked up to the counter "i-i think my egg is ready to hatch." She mumbled scratching at the back of her head. She always had trouble with facing even the people that were supposed to help. OMFG can't believe I hatched an Aerodactyl! Picking up my gorgeous protective baby and putting her in a regular Pokeball. Naming her Artemis and declaring her ability to be Pressure. Also going to teach her my TM Dragon Claw. Last edited by TheKnightsFury; 07-19-2018 at 01:08 AM.